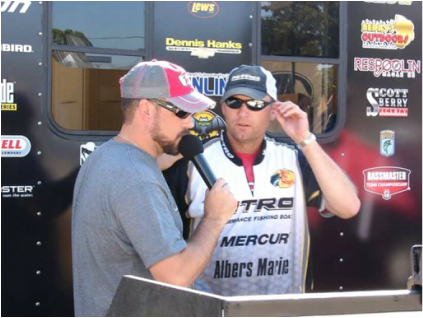 Curt Graves - Albers Marine, Inc.
Curt has fished Ozark BFL, Heartland, Central Pro-Am, Joe Bass, Anglers in Action, and various other tournaments in the 4-state region over the past several years. Some of his highlights include winning the 2008 Table Rock Central Pro-Am tournament, being the 2008 Central Pro-Am Rookie of the Year, 2nd Place finisher at the August 2010 Truman Anglers In Action tournament, as well as numerous championship qualifications over the past few years. Curt is currently the high school principal in Willard, Missouri. Living in the northwest Springfield area allows him to fish Table Rock, Stockton, Truman, Pomme De Terre, Lake of the Ozarks, and Bull Shoals regularly. Curt says some of his favorite techniques are to pitch plastics to docks and swim a grub in the winter which he has been doing with Lews rods and reels. Thanks Curt! We are proud to have a man who enjoys sharing the outdoors with others as much as you do on our team!